The following comes to us from Dr Lynne Lynne Bissonnette-Pitre, who writes about the purpose and history of the Sacred Liturgy Conference held annually in Salem, Oregon, which she began in 2003. For more information, see the conference website and Facebook page, and the video below. The Holy Sacrifice of the Mass is a celebration and a sacrifice. But what exactly is it that we are celebrating and what is being sacrificed? Is the sacred Liturgy directed to God or to us? It is said to be the source and summit of our faith. When we know what the liturgy is, then we will know how to celebrate it properly. From the beginning, the Church has understood that the sole purpose of the liturgy is to seek God and to give Him glory. The Liturgy is not a means to an end. The liturgy does not seek attention for itself, it doesn’t seek to entertain or to influence the world. When the focus of the liturgy is (as it should be) totally on God; it is theocentric and contemplative. The focus is on Christ, His Words, His action, His Passion. The boundary between heaven and earth collapses as Jesus lifts us into Himself and gives Himself totally to us. We witness the Holy Spirit converting the bread and wine into the glorified and transfigured Body and Blood of Our Lord Jesus Christ. We behold Jesus in His glory and receive Him in the radically transformed material reality. This experience in the Eucharist is purgative and illuminative. It leads to our sanctification, to our transfiguration and ultimately to the sanctification and transfiguration of the world. H.E. 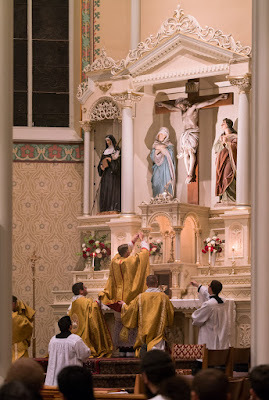 Alexander Sample, Archbishop of Portland, celebrating a Pontifical Mass at last year’s conference. To make known the profound purpose, meaning and ancient beauty of the Eucharistic Liturgy is the goal of the annual Sacred Liturgy Conference sponsored by Schola Cantus Angelorum. The conference aims to educate and inspire the faithful with an understanding of the Eucharist as the right worship of God and the consequent life changing realities of the Holy Mass. Through lectures presented by an international faculty of scholars and through the four Eucharistic liturgies, the theocentric and contemplative dignity and beauty of the sacred, ancient liturgy is illuminated and experienced. Why do the people desire sacred worship and holiness? Sacred worship of Holy God and the consequent personal holiness are necessary. Sacred worship is the first and one essential thing. It is the one thing necessary before confronting any and all interior and exterior evil. How we pray the liturgy affects how we believe, which determines who we are and how we live our lives (Lex orandi; Lex credendi; Lex vivendi). The Holy Mass is the major source of our spiritual formation and our sustained growth in holiness which determine our impact upon the world. St. Benedict taught that nothing is of greater importance than the Liturgy. It is through the liturgy that we become holy and the world is sanctified. The theme of The Sixth Annual Sacred Liturgy Conference 2018 is “Transfiguration in the Eucharist”. Special guest speakers include Bishop Athanasius Schneider from Astana, Kazakhstan; Rev. Cassian Folsom, OSB from Norcia, Italy; Bishop James D. Conley from Lincoln, Nebraska, Msgr Andrew Wadsworth of Washington DC, and many other distinguished scholars. The greater our knowledge and understanding of the Transfiguration in the Liturgy, the more prayerfully we can participate in the sacrificial offering and Transfiguration of Our Lord Jesus in His Eucharistic liturgy. The four beautiful Gregorian liturgies of the 2018 Sacred Liturgy Conference will be celebrated in both forms of the Roman rite and in the Dominican rite. The conference will offer the Sacrament of Reconciliation, Eucharistic adoration, catered meals and time for fellowship. In addition, Alex Begin will conduct workshops for priests, deacons and seminarians on celebrating the Extraordinary Form of the Mass and Nicholas Lemme will lead his very popular workshops on learning the basics of Gregorian chant. Please visit www.SacredLiturgyConference.org for full details. The conference is June 27 to 30th 2018 in Salem, Oregon. Register today as space is limited and last year sold out early.